Since 1987, I've bought several traditional Cappadocian houses in Urgup's Esbelli district, noted for its fine old stone homes. I combined and restored them using local artisans, to make an inn. I wanted to create a warm, welcoming atmosphere for visitors who would stay in comfortable 'cave rooms' and enjoy my inn as though it were the home of a Cappadocian friend. Since then, Esbelli Evi has hosted thousands of travelers, and my dream has come true: I now have friends all over the world. Many people have urged me to enlarge the inn and have more than my ten rooms, but I would rather keep it small and preserve its warm, personal atmosphere. Because Esbelli Evi is small, it's important to make advance reservations if you can. 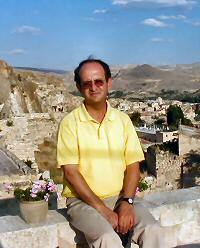 I would like to meet you and help you to enjoy beautiful Cappadocia. For centuries, inhabitants of the Cappadocia region of central Turkey carved their homes out of the volcanic rock that forms the landscape, in some places building entire beehive towns out of hillsides. Since 1990, visitors to this remote area have been able to sample a luxurious version of the cave life, thanks to the internationally acclaimed Esbelli Evi Hotel. 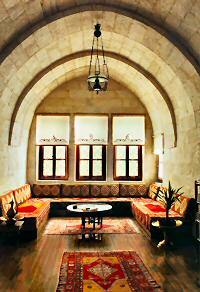 Located above the town of Urgup, Esbelli Evi is the vision of Suha Ersoz, a confirmed bachelor and former lawyer. In the last seventeen years he bought nine abondened cave houses. Together with the abandoned 5th- and 6th-century caves behind them, he transformed the property into a one-of-a kind hotel. The result is a timeless experience, pure fairy-tale romance. There are only 10 sandstone-coloured tufa rooms, some are in a cave. Each room is different -- some have fireplaces or a naturally formed chimney, while others have naturally formed staircases. Mr. Ersoz employed talented local tradespeople to modernize each cave. Each room has hardwood floors, a modern bathroom with marble showers and a king-sized brass beds. Closets were carved out of the walls, Barney Rubble-style, by local stonemasons. The furniture is Ottoman, the kilim carpets come from Ersoz's grandmother's house, and his mother made the traditional lace curtains. Yet, one does not forget he or she is staying in a cave. Rooms connect to the rest of the hotel through carved-out passageways and courtyards. The small, friendly staff serves breakfast on the rooftop terrace, which offers a panoramic view of the surrounding countryside. The menu is freshly squeezed orange juice, cheese, olives, fresh tomatoes, cucumbers, boiled eggs, freshly-baked breads, coffee and homemade preserves. The nightly showing of sky-bound stars beats anything offered during sweeps week. The main drawing room features CDs from the owner's collection of opera -- Stan Getz, Billie Holiday and Miles Davis, current periodicals from around the world and several coffee-table books describing the world's great hotels. Mr. Ersoz's creation can be found in each.